SmartPro 1500 VA Rackmount/Tower Digital UPS Line-interactive 1500VA 900W w LCD. Line-Interactive Digital UPS System offers voltage regulation, surge suppression and long-lasting battery support for personal computers, network workstations, entertainment systems and more. System prevents data loss, viewing interruptions, lost recordings and loss of programming. AVR circuits regulate brownouts and overvoltages from 75V to 147V back to usable levels without using battery power. Complete power protection with support for upright tower, flat shelfmount or 2U rackmount installation. Built-in USB and DB9 serial port enables optional unattended system shutdown; cabling included. HID-compliant USB interface enables full integration with built-in power management and auto shutdown features of Windows, Mac OS X and Linux. Built-in single-line RJ-45 jacks offer protection for equipment with single-line tel/DSL or network Ethernet connection. UPS system offers a 13 minute, half-load runtime. Input Voltage: 110 V AC. Output Voltage: 120 V AC. Waveform Type: Pulse-width Modulated Sine Wave. Receptacles: 8 x NEMA 5-15R. Maximum Battery Recharge Time: 8 Hour. Backup/Run Time (Half Load): 13 Minute. Backup/Run Time (Full Load): 3.50 Minute. Load Capacity (VA): 1500 VA. Load Capacity (Watt): 900 W. You are purchasing a product designed for use in North America. The power and transmission requirements may be different then in your local country, please make sure to follow all applicable use and safety regulations. Government and shipper regulations prohibit such behavior. We understand that our customers may change their mind after purchasing a product. We may no longer be able to change or cancel your order. Please excuse any image and typographical errors. 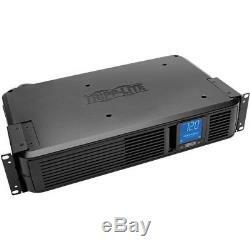 The item "NEW Tripp Lite SMART1500LCD SmartPro 1500 VA Rackmount/Tower Digital UPS" is in sale since Monday, February 5, 2018. This item is in the category "Computers/Tablets & Networking\Power Protection, Distribution\Uninterruptible Power Supplies". The seller is "targetpcinc" and is located in Willoughby, Ohio.